The Great Scrape is an all natural BBQ cleaning tool. It is an alternative to the old metal wire brush. It custom grooves to uniquely fit your barbecue grill without having to worry about metal bristles or harming your grill grates. 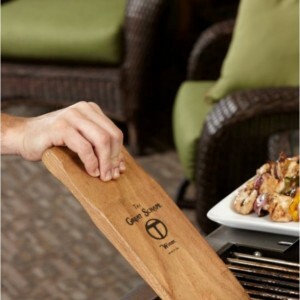 It is made of solid red oak and is designed for years of grilling pleasure. How it works: 1) Get your grill hot To start the groving process, ensure your grill is hot (high heat allows the grooves to form quickly). 2) Work back & forth Using slow firm pressure, pass the Great Scrape front to back on the hot grates until the grooves begin to form. 3) Repeat Align the previously formed grooves to the grates ensuring that only ONE good set of grooves are formed. Once grooves have formed, high heat is no longer necessary. 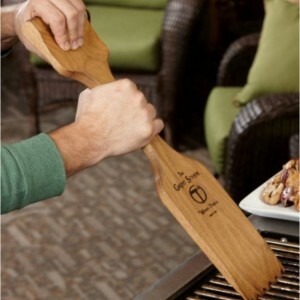 It makes for a perfect BBQ gift.